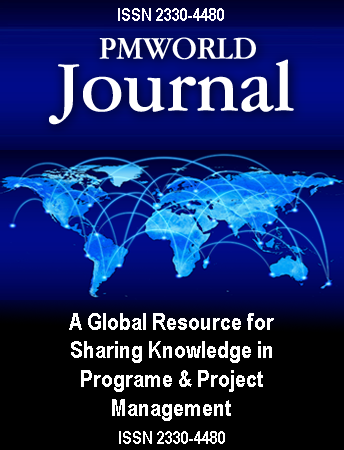 The PM World Journal (PMWJ) is also intended to be a global resource for project-oriented organizations. The PMWJ provides educational content for educating and developing project managers and their teams, new information from around the world of professional project and program management (P/PM), opportunities for corporate executives and professional staff to increase their credentials through publishing articles and papers, and various opportunities for organizations to gain positive visibility. Continuous improvement in organizational performance today often requires increased productivity, new methods and technologies for accomplishing projects, new or different resources, new approaches, and even new information. Project managers and their teams must embrace continuous learning in order to develop new knowledge and skills, to stay abreast of changes in the P/PM field, and to manage increasingly complex programs and projects successfully. Each month, the PMWJ will include new articles and papers from around the world, with new P/PM topics, new perspectives, new knowledge. Whether individuals and teams learn a little or a lot, continuous learning can only help organizations be more successful. Most P/PM professionals are anxious to advance their careers, through education, professional certifications and other means. In today’s economy, with increased pressures on budgets and overheads, more organizations worldwide have reduced investment in professional development for employees. The PMWJ offers a low-cost alternative for professional learning and development. Read and share PMWJ articles within your team. Read the case studies and book reviews, and the news to keep up with the PM profession. Better yet, promote the authoring of articles and papers within your organization; that can bring positive benefits to authors and organizations alike. Many factors can influence the success or failure of programs and projects today, especially those involving multiple teams, multiple international locations, multiple stakeholders, significant complexity, complicated environmental considerations, new technologies, large budgets, long schedules and other conditions. In addition, with rapid changes continuing in the P/PM field, information about new developments might be highly useful for many organizations. In all cases, program and project managers should try to stay abreast of changing conditions that might affect their projects. Each month’s edition of the PMWJ will include news related to research, education, professional activities, events and other news affecting P/PM around the world. Reports from industry and about programs and projects will be included. While it might not be everything you need to know, you might find something highly interesting or useful. Authors of articles and papers about P/PM can quickly establish themselves as experts in the subject of their writing. Program and project managers who openly discuss their approaches, experiences and solutions quickly establish credibility with readers, many of whom may be potential customers or stakeholders. When senior executives and managers author professional papers, their organizations are often viewed as more mature and more capable. Many organizations provide white papers for customers for just this reason. If you want your organization to have more credibility in the P/PM professional field or marketplace, encourage the authoring of professional papers for PMWJ publication. Most organizations value positive publicity. If your organization has some news that can be shared about your programs, projects, people or P/PM capabilities, submit an article or story for publication. If your executives or project managers have some great experience or knowledge, showcase that expertise in an article or paper. Gain some visibility! Create some buzz about your organization – personal word of mouth can be the most effective marketing possible.